Since becoming a lot more serious about my baking passion as of late, I decided it was time to really start reading up on baking, not just checking out cookbooks, but seeking out information about the science of it. One thing that I love about baking is that it really is just simple chemistry, and if you can learn the hows and whys of different ingredients and mixing techniques, it demystifies the whole process and lets you troubleshoot your own baking issues as you try new recipes or work on old favorites. In fact, just last night I spent a good portion of a party conversation with a stranger explaining to her why her various baking "failures" probably happened, and she really seemed to be fascinated, nay, EMPOWERED by it all. And I really don't think she was just pretending. Really, I don't. But that is neither here nor there. There are two books that are in my rotation right now that are so blowing my mind. More like baking textbooks rather than cookbooks, though both have great recipes as well. 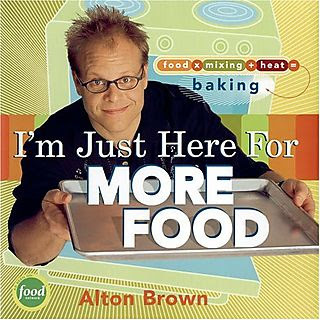 The first is by Alton Brown, with whom I am falling more in love everyday (seriously, did anyone see him in the Iron Chef episode of "The Next Food Network Star"? He was all scruffy looking and in a suit and...I want to insert something here about how I need to get out more, but I just won't, okay? I love him in all his nerdy culinary hotness. The end.). The book is called I'm Just Here for More Food, and honestly, if food chemistry could have been explained to me in this delightful and easy to understand manner in high school, well, let's just say a lot of things would have been different. 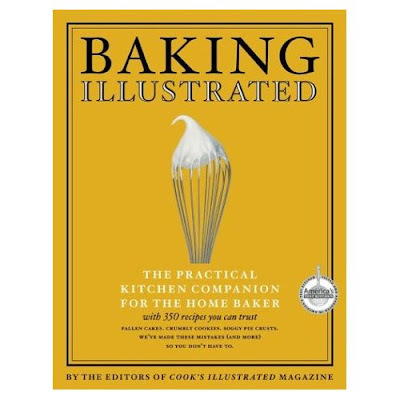 The other book I'm loving is Baking Illustrated by the chefs of Cook's Illustrated magazine and America's Test Kitchen (one of the best PBS cooking shows EVER, by the way, The Frugal Gourmet notwithstanding). It's like the Bible of baking, totally genius. Before every recipe in the book, they give you the detailed story of how they arrived at that particular recipe, outlining all the failures along the way. Each recipe is what they have deemed the "perfect" formula of a given baked good and what makes it so, kind of like a "we already made all the mistakes so you don't have to" kind of thing. And surprisingly, the writing is actually kind of funny and really entertaining to read. Get thee to Amazon, that's all I'm saying.